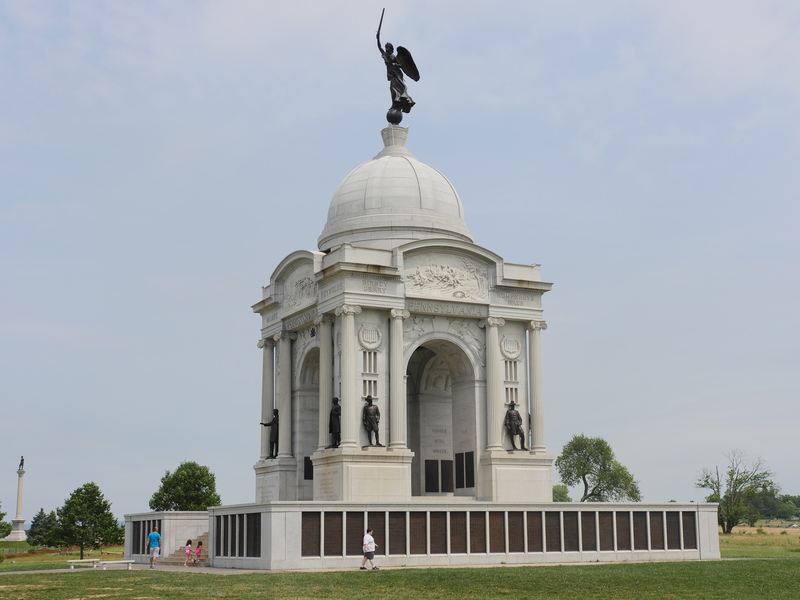 In my last article, I covered the first two days of my stay in Gettysburg. The first two days helped us get familiar with the area and discover all there was to do there. With two days left to explore Gettysburg, we found plenty to do. 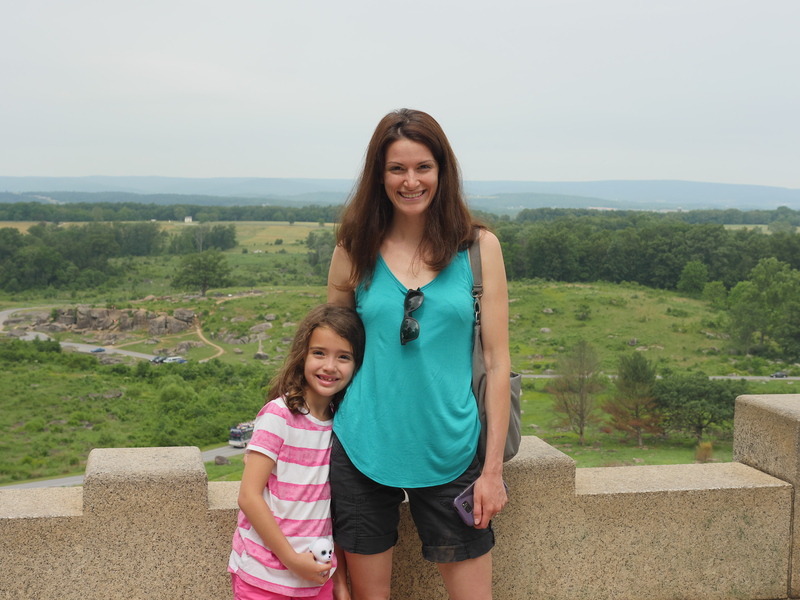 If you are spending more than a couple days in Gettysburg, my sample itinerary of Days Three and Four of my visit can help you discover some family friendly activities beyond what you might do in a short weekend getaway. On our third day, we spent the morning at the hotel pool at the Gateway Gettysburg Wyndham Hotel. Swimming right after waking up meant the pool wasn’t busy. Next, we went out to The Outlet Shoppes At Gettysburg, and then, we wanted to find a kid-friendly activity. My children had patiently spent the morning shopping with me. To reward them for their patience, we stopped for a game of miniature golf. Mulligan MacDuffer Adventure Golf was conveniently located five minutes away from the outlets. We went at an off time and found plenty of parking. At first, a couple families were in front of us. By the time we finished playing, the golf course was empty. This quiet experience was lovely and refreshing. Located on four acres of landscaping, Mulligan MacDuffer Adventure Golf offers two 18-hole championship courses in Gettysburg, Pennsylvania. We hadn’t played miniature golf since our visit to Ocean City, Maryland in 2015. Now, my younger daughter was the perfect age to get into the game. She was too short to use most of the golf clubs, but the person behind the desk found one just the right size for her. 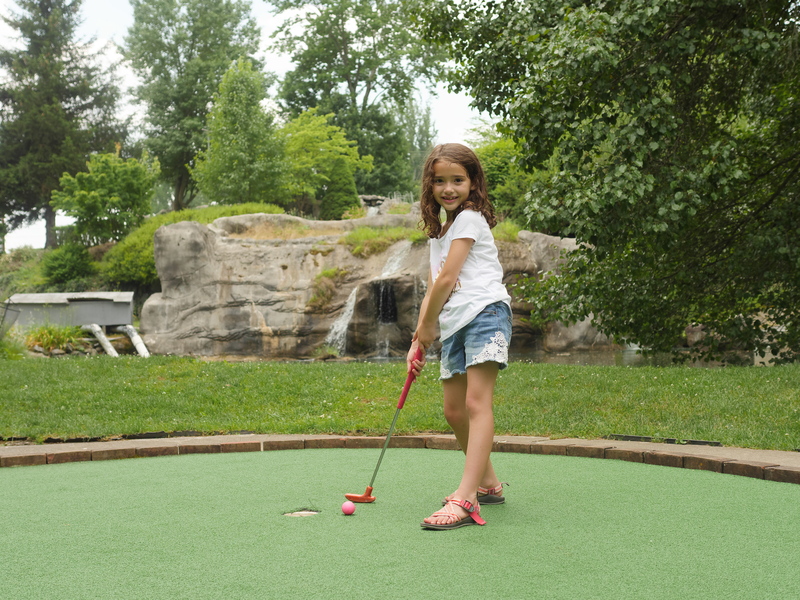 Children of all ages enjoy the lush scenery at Mulligan MacDuffer Adventure Golf. My older daughter was at a good age to get competitive with the game. She said this was one of her favorite parts of our vacation. 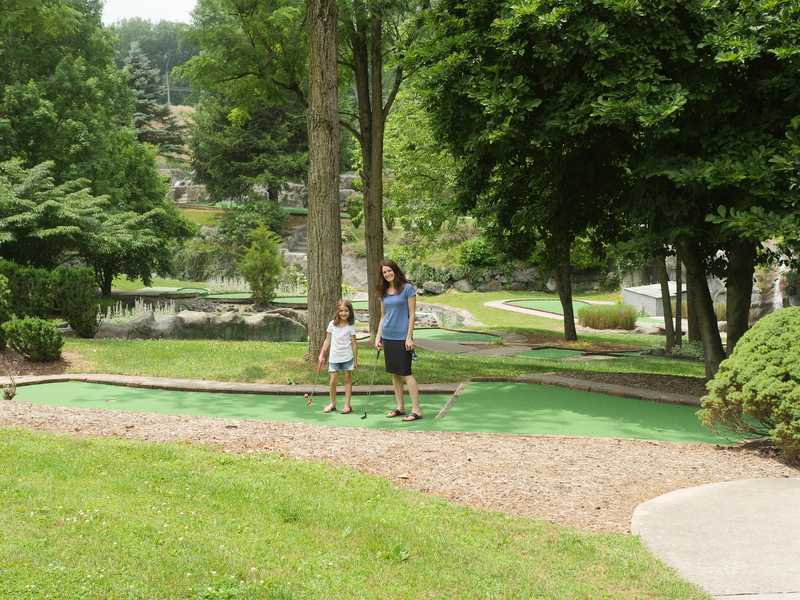 In between seeing the historical sites and museums, playing miniature golf was a kid-friendly, relaxing activity. Not only did playing golf entertain the children, but it also reminded my husband and me of the fun we had playing miniature golf on our childhood vacations. With streams and waterfalls, the golf course offers a relaxing experience for families. Although Gettysburg is well known for the role it played in the Civil War, it also offers fun activities families can enjoy. 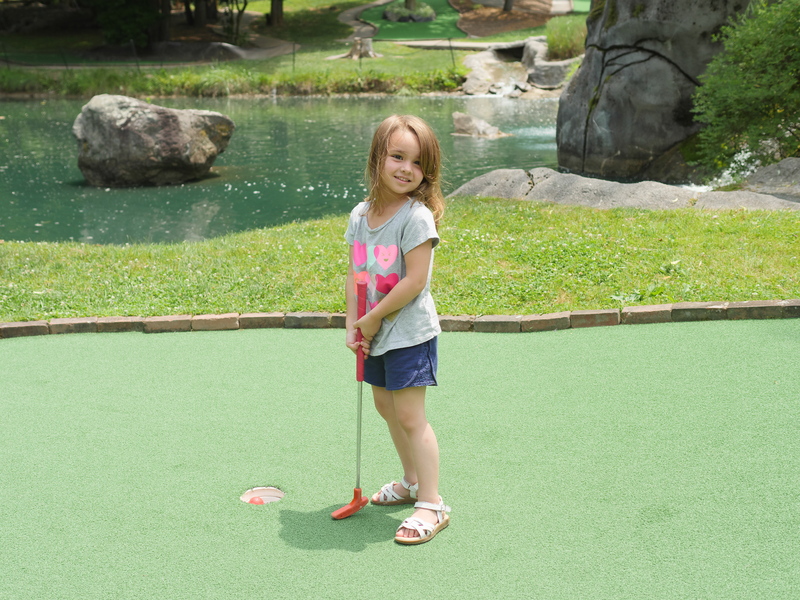 We enjoyed miniature golf because it was a rare treat that our children usually only get to do on special vacations. After miniature golf, we rested in the hotel for a while and saw a late night movie showing at the Gateway Movie Theater. Our third day was pretty low key. We didn’t visit historical sites, but with several other days to do that, it was nice to do some typical vacation activities. When we woke up on our fourth day, I knew getting a late check out at the hotel was ideal. There was so much left to do! Luckily, since the hotel was accommodating, I could come up with some last minute plans for the remaining hours we had in Gettysburg. When we took a carriage tour of the battlefields on Day Two, I saw some incredible places at a distance. On our last day, exploring Gettysburg gave us the opportunity to see the battlefield up close. We drove to Little Round Top and looked down at a beautiful landscape where such a tragic battle occurred. The view from Little Round Top was one of the most beautiful landscapes I have seen since moving to the East Coast. 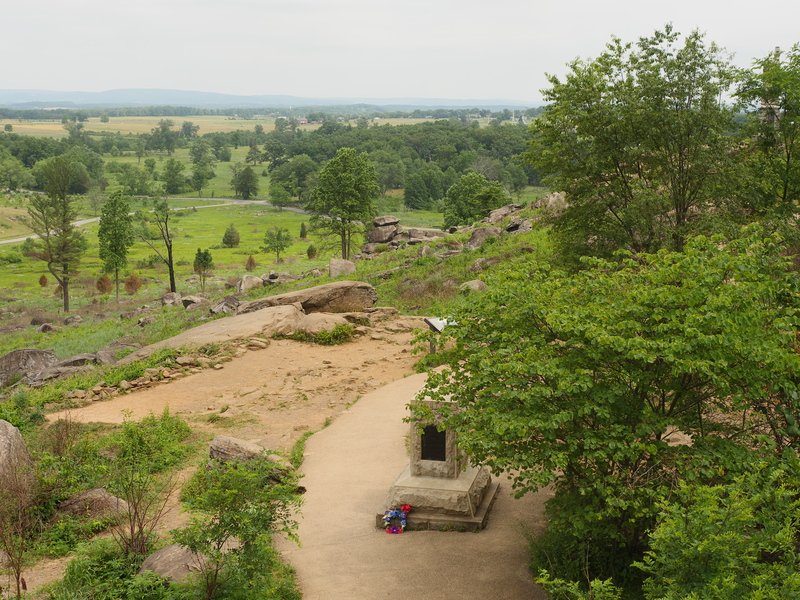 During the Civil War, Little Round Top played a key role in which side would win the battle. Although I am no Civil War expert, I would imagine that being at a vantage point so high would provide a good view of what was coming. The view from Little Round Top in Gettysburg, Pennsylvania. 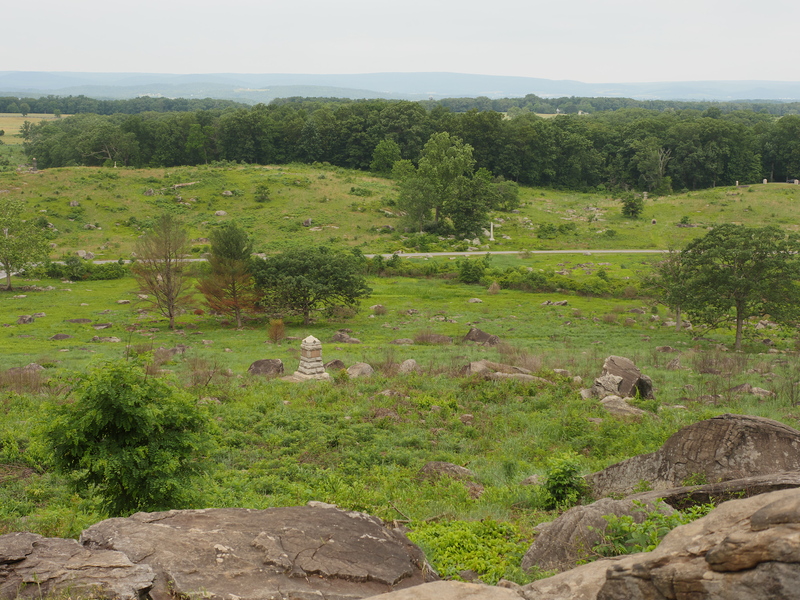 To get to Little Round Top, we parked down the road and hiked on a trail. Although the trail didn’t say it would lead us to Little Round Top, it looked promising. Hiking in the woods to get there was one of my children’s favorite part of our trip. They loved exploring the woods and being adventurous with us. When we reached an unmarked path that would cross the main road, we knew we were heading in the right direction. Looking down from Little Round Top was breathtaking. Although we took a small hiking path to get there, you can also park along the road next to Little Round Top. We didn’t drive that way, but if you head down the road that has the Peach Orchards, you can turn and get to the lookout spot. Another advantage of visiting the battlefield was getting to see the monuments. Passing by such interesting structures on the carriage ride piqued my interest, and I was excited to return. I was especially interested in seeing the Pennsylvania State Memorial. At 110 feet tall, the Pennsylvania State Memorial is the largest monument at the Gettysburg battlefield. We were able to find parking right next to the Pennsylvania State Memorial. Until a bus of students arrived, the area had few visitors. After climbing to the top of the memorial, we could see for miles in front of us. Although my children were a bit young to really understand the events that had taken place there, they enjoyed the adventure of walking up the steep staircase and appreciating the incredible view. Climb to the top of the Pennsylvania State Memorial for an incredible view of the Gettysburg battlefield. My older daughter learned a lot during our visit. She doesn’t have all the facts down about the Civil War, but she gained a basic understanding of how devastating the battle was. 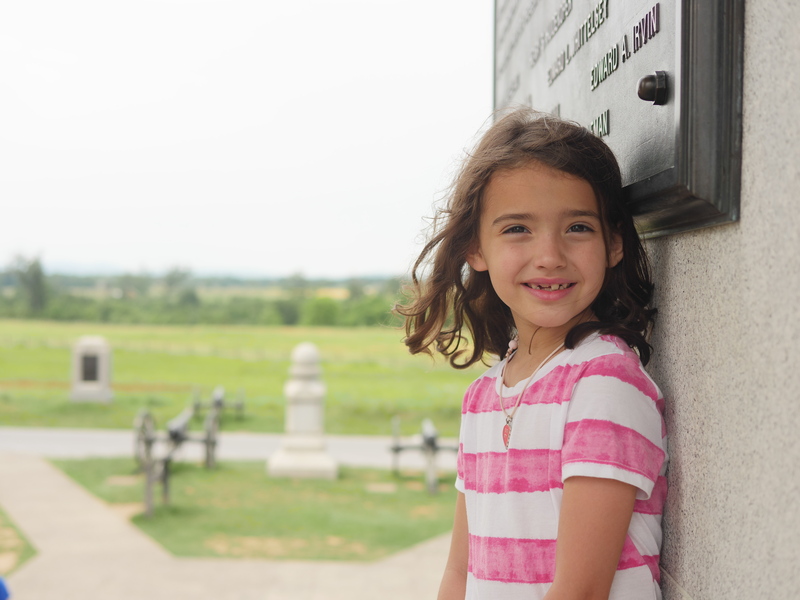 My daughter looking out from the Pennsylvania Monument at the Gettysburg battlefield. This was the first vacation she has been on that had such a valuable lesson. Together, we have seen some other historical locations (Annapolis and Washington DC), but the focus was more on the colonial era and how America gained its independence. Learning about the only civil war that has taken place in our country was eye opening for her. Gettysburg offers a unique learning opportunity for children as well as adults. 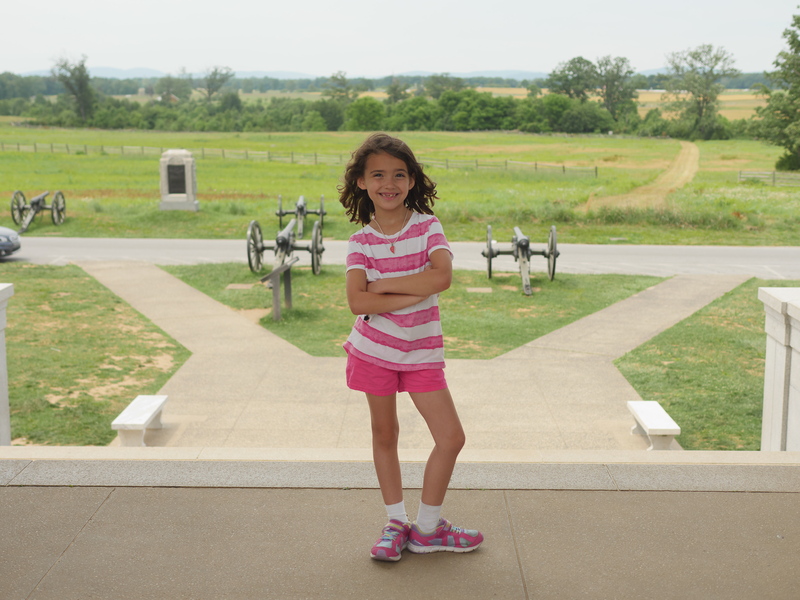 Although in school, she will not learn much about the Civil War in detail for several more years, I was glad to see that she was a good age to experience this trip. On our way out of Gettysburg, we had time for one more meal. We had tried some sit down restaurants (Dobbin House Tavern and Appalachian Brewing Company), but we wanted something more casual. With only hours before check out time, we stopped in Dunlap’s Restaurant and Bakery. Located downtown, Dunlap’s has parking available. The waitress was friendly. Even though we were eating at lunchtime, there was plenty of seating. 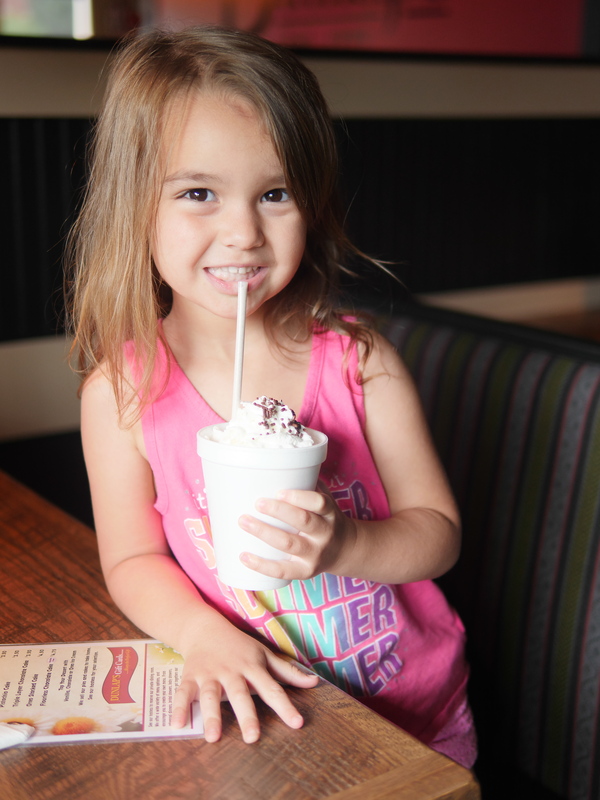 My children’s favorite part about eating at Dunlap’s Restaurant and Bakery was getting a milkshake with their kids’ meal. While the meal was tasty, our favorite part was the dessert. The blueberry pie was delicious. With the warm pie and the ice cream slowly melting on top, it was the perfect end to a wonderful vacation. 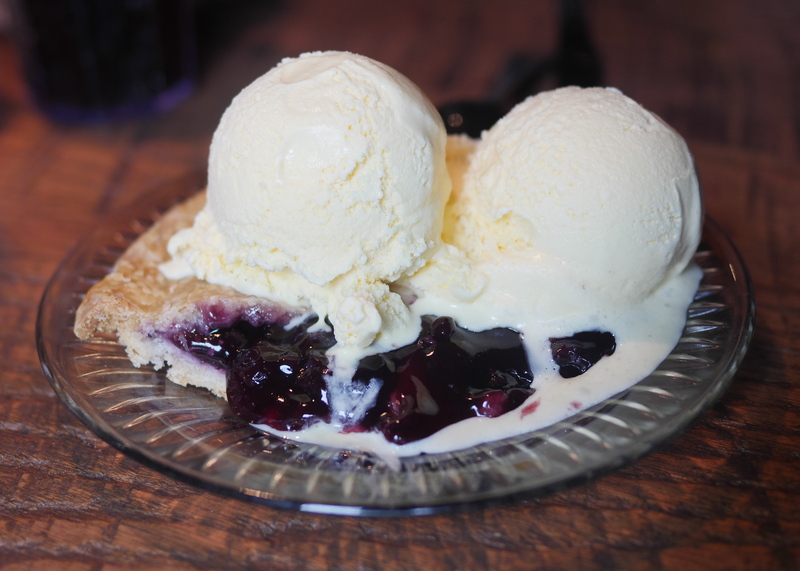 If you dine at Dunlap’s Restaurant and Bakery, try the blueberry pie. Visiting Gettysburg was a wonderful start to our summer. I was glad that my children were learning even though they weren’t in school, and that they were actually enjoying the learning process. Plus, with milkshakes, blueberry pie, and miniature golf, the vacation offered plenty of fun for the whole family. For more travel tips, follow Theresa’s Reviews on Facebook, Twitter, Instagram, Pinterest, and Youtube. 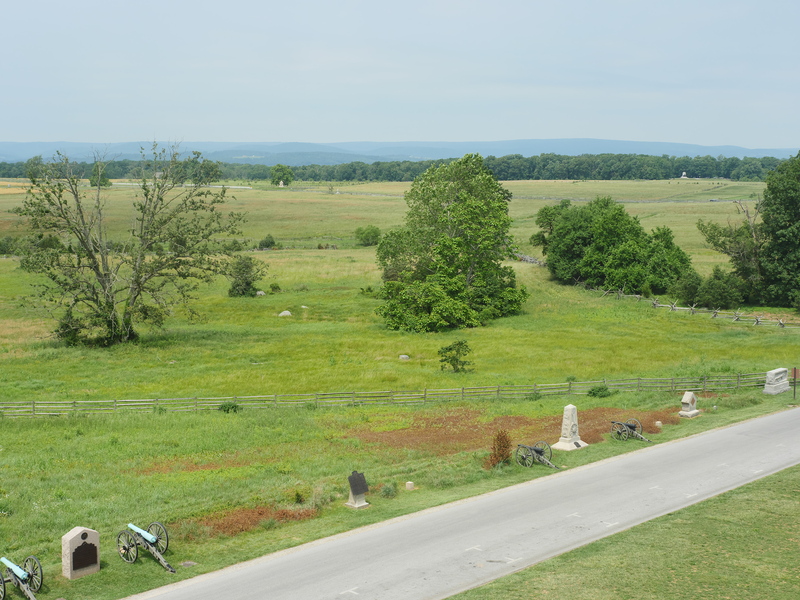 You can also click on the photos below for more articles about Gettysburg. It sure sounds like you did a lot while you were there. I really want to get to Gettysburg one of these days. I love places full of history and educational moments. I have never thought to check out Gettysburg but I very much want to check it out now! I am a big history buff, along with the members of my family, and we visited this place years ago. I remember getting emotional about thinking of all the blood shed there. Gettysburg is on our bucket list for sure! We love historical vacations, and this one looks awesome! I think this is even more fun especially with the kids! It has been a while since I last played mini golf and I miss the excitement and the fun! It would be nice to show the kids the battlefields and the memorials. This looks great! What a fun and educational trip as well. I think my kids would love this. I know I would! This sounds like a great family friendly place. Plus you got a ton done while you were there. I’m a PA resident and former history teacher so I’ve been wanting to get here so badly. We always drive through on our way home from vacation, but we’ve never made plans to stop. Going to add this to the list of weekend getaways for sure! Great post! Wow this is incredible! love love love!! This reminds me of so many family vacations we used to take. We would explore the area, do some shopping and of course play mini-golf. Looks like a fun time! I haven’t been to Gettysburg but looks like there are lots of fun things to do. Definitely mini golf is a favorite for our family! It looks like you had so much fun! Mini golf is so fun. This is fantastic when your daughter gets to learn about Civil War in class, she will have some form of visuals to go with it and I know she will even more so enjoy the lesson. I like the miniature golf and the hiking that you did. So much fun. What a great itinerary, I know my family would love to take a visit to Gettysburg. It would be a great trip no doubt! I went here with my family a few years ago, but we didn’t do this much exploring! Definitely saving this for a trip part two! The last time I was in Gettysburg, I was a young teen, and didn’t apprecaite it half as much as I should have. I’d like to visit again now that I really understand the weight of the history there. I love mini golf. That course looks amazing too. What special quality time for your family! Thanks for sharing it with us! This would be so much fun! I love any trip where you can learn about the history of our country! My husband and daughter would love this trip. They are such history buffs.